Metro Erecta Accessories include dividers and ledges. 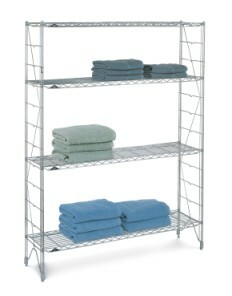 Additionally, Regular Erecta Wire Shelving comes in all sizes and finishes like chrome. Because Erecya SHelving is easy to assemble as it has grooves on shelves position and lock shelves to the uprights. Uprights--diagonal wire provides additional support. Adjustability--Shelves can be placed at 5" (127mm) intervals along the upright.